Logan Sports Marketing was appointed to manage the commercial relationships for The British & Irish Lions on their Tour to Australia in October 2011. In the two years lead up to the Tour, LSM joined The Lions Management team, providing a seamless extension to the Commercial, Media and Operations Directors to plan, manage and execute the project. 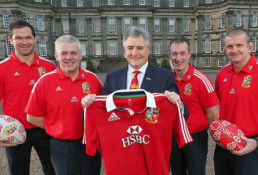 LSM delivered the commercial rights for The Lions’ Principle Partners, Global Sponsors and Official Suppliers (HSBC, Adidas, First Cape, Land Rover, Microsoft, Thomas Pink, Qantas, Robert Walters, Rhino, Red Bull, Maximuscle, Financial Times, Talk Sport and Sky Sports). LSM also managed The British & Irish Lions brand IP, all sponsor/supplier artwork approvals, and working closely with the LSM Events team, oversaw the planning, set up and delivery of all live broadcasted press conferences. On Tour, in addition to managing commercial appearances, sponsor activity and assisting with press conferences, LSM planned and oversaw the logistical delivery of all supplier product requirements throughout the Tour and delivered branding at the 14 training venues and 10 stadiums used throughout the UK, Ireland, Hong Kong and Australia. In Hong Kong additional event management support was also provided. Winning the Series 2-1 for the first time in 16 years was the perfect finish to an incredible partnership!